The workshop was attended by 73 scientists, conservation practitioners and policy makers from 13 countries: Austria, Belgium, Denmark, Finland, France, Germany, Greece, Ireland, Portugal, Spain, Sweden, Netherlands and the UK. Delegates included representatives from the European Commission DG Environment, and Government departments from EU member states. Comparison of impact assessment and decision making approaches to determine the N deposition impacts of plans and projects in the context of Habitats Directive Article 6.3 obligations. Comparison of approaches to assessing and reporting N deposition impacts on conservation status (Habitats Directive Article 17) and discussion of harmonising approaches for future reporting rounds. 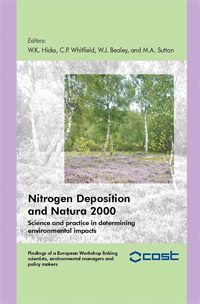 New science on the effects of N deposition and concentrations on Natura 2000 sites, including bio-indicators, effects of N-form (e.g., NHx vs NOy), and the relationships between critical thresholds and biodiversity loss. Approaches to modelling local N deposition and concentrations in the regulatory context of Natura 2000. Options for future policy development to manage and mitigate the impacts of N deposition effects on the Natura 2000 network.